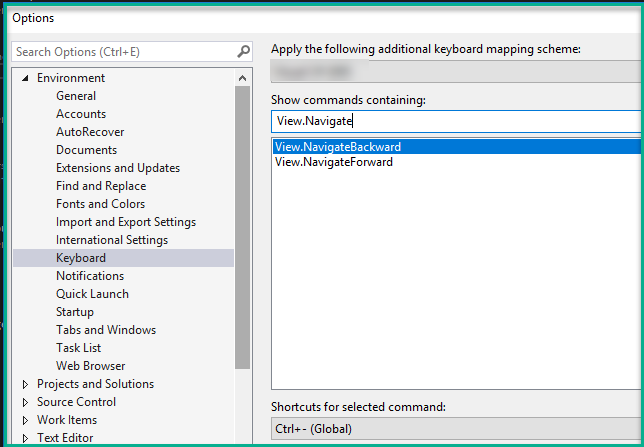 What is the keyboard shortcut navigate back to the last cursor position in Visual Studio? It Will not work for red color (-) key. For me it only works for blue color combination. According to Visual C# 2008 Keybinding Reference Poster it is Ctrl + -. The name of the specific keybinding is View.NavigateBackward. PS: While researching I also found that Ctrl + . is the same as Shift + Alt + F10. Nice! ctrl + - (dash) navigates backward. ctrl + shift + - (dash) navigates forward. Not the answer you're looking for? Browse other questions tagged visual-studio navigation keyboard-shortcuts or ask your own question.